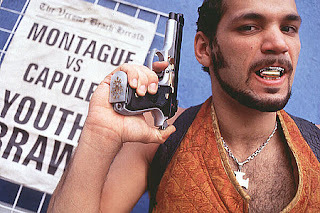 The first time I walked into Baz Luhrmann's Romeo + Juliet , I walked out ten minutes later. Essentially, I was unprepared for the near-seizure inducing style of presentation which consisted of an aggressively campy cacophony of crude sights and sounds culled from an ADD addled contemporary society of MTV flash and video game short concentration levels. 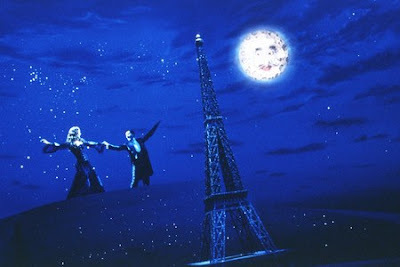 Thus, I fled the theatre in the same fashion that I nearly did in the first act of Moulin Rouge! . However, the musical-fueled lusty abandon of hedonistic proportions in the romantic Rouge kept me in my chair. Nonetheless, after seeing his weakest link, Australia , I've come to the same conclusion. Namely, while he's a technical virtuoso and I greatly admire his unwillingness to compromise his own vision even if that would contribute to greater clarity for those trying to process the flurry of information hurled at us at light speed, when it comes right down to it, Baz is just no good at beginnings. Tonally all over the place, Luhrmann mixes genres and emotions like they're colors of paint he's placing in strange juxtaposition on a canvas. It's only by standing back and taking it all in after letting it wash all over you like a head rush for the better part of a cinematic first act that you're eventually able to lose yourself in his universe. And to guide us more successfully into the at-times overly flamboyant worlds where headaches are just a mere montage or false note away are Luhrmann's ace in the hole -- his exceptionally well-cast leads. 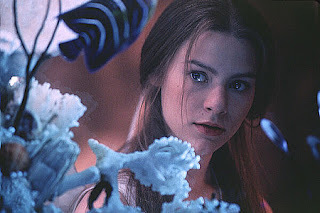 For it's only when the penniless writer (Ewan McGregor) meets the sparkling courtesan (Nicole Kidman) in Rouge or Romeo (Leonardo DiCaprio) first catches sight of Juliet (Claire Danes) from the other side of a fish aquarium in Luhrmann's trippy exploration of the essence of Shakespeare that we become truly plugged right into the grandiose love-conquers-all spirit put forth in his “Red Curtain Trilogy," (which also includes Strictly Ballroom) . 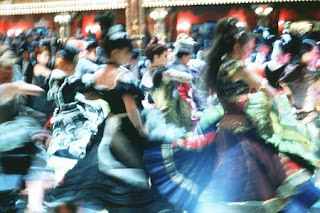 While I still find the beginnings of both works particularly jarring, atonal and out of sync visually and aurally, ultimately, it's the winsome way that Luhrmann endears us to the old-fashioned invincible feeling of a rush of romantic blood to the head embodied in classic movie musicals and Hollywood golden age pictures that eventually finds me a helpless and rather willing prisoner, caught up in the drama. 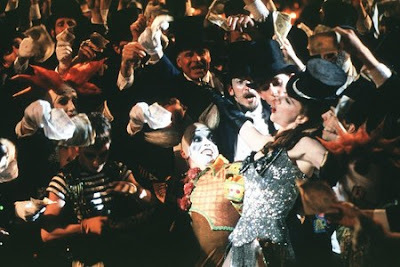 And with this in mind, as a reviewer with a weakness for women's weepies and MGM tune-filled epics, it's no wonder that I have a particular fondness for the masterful Moulin Rouge!, which predictably sparkles even brighter in this pitch-perfect Blu-ray transfer, supervised by Luhrmann that's filled with bonus features. 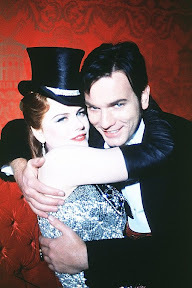 Even though I still can't watch the male chorus led by Jim Broadbent butcher “Like a Virgin” to ever-creepy heights without cringing, Moulin Rouge! is an unrivaled sensory experience that is easily one of our strongest modern-day musicals, not based on a Broadway production. Admittedly, in addition to the clunky kick-off, there are a few sour notes. 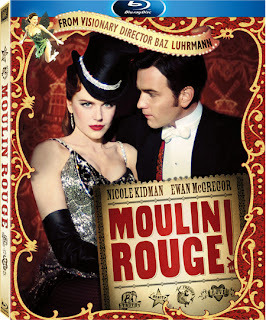 John Leguizamo's slightly annoying take on Toulouse-Lautrec as well as Kidman's pleasant but pipe-power challenged soft singing approach that is routinely overpowered by the instruments and McGregor's phenomenal belting ability are indeed flaws. But when taken altogether, the weaknesses are just small prices to pay for such a unique and largely unforgettable diamond. 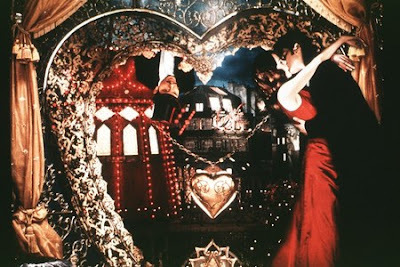 Building off of the montages he hit us far too over the head with in Romeo so that at times we actually feel as though we're flying right out the window of the writer's room straight into the Moulin Rouge, overall this final Red Curtain work illustrates the way that the cinematic discoveries Luhrmann made on the mean streets of Verona have now become smoother and more streamlined. 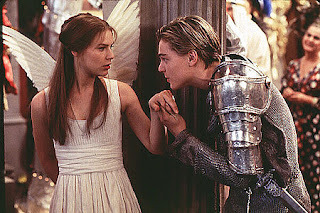 Yet despite my belief that the remarkable chemistry between Danes and DiCaprio actually rivals that of the Rouge couple for most likely to start a fire, Romeo never quite manages to marry Luhrmann's ambition with his approach. Frequently, framing devices, flashbacks, voice-overs, and forced TV footage intercut into the action call far too much attention to themselves, uprooting us from the romantic reverie of watching the spectacle to instead jilt us like a stood-up bride or groom on our wedding day. 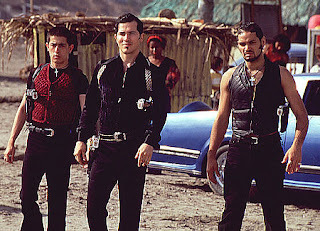 And while Luhrmann does earn points for inventiveness especially considering the water motif used with the leads, from near ethnic gang-banger cliches to an acid dropping drag queen that feels like an escapee from Adventures of Priscilla... , Luhrmann's collage is overall more distracting than cohesive. But just like Rouge, it's quite a sight to behold in high-definition if you manage to make it past the opening ten minutes, which is easier now at home instead of being overwhelmed at the cineplex. 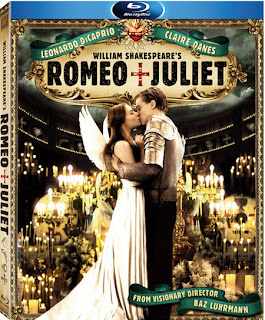 Still, sadly it's a disappointing misfire especially when you consider that – all logic and time-gaps aside – one doesn't exactly find more inspiring source material than Shakespeare given the amount of times his work is adapted for stage and screen each and every year. Yes, I do applaud the attempt to inspire a new generation to seek out the text for themselves, but ultimately I fear that the language gets lost in the chaos, leaving us with a problematic picture as opposed to a naturally poetic one. Nonetheless, and with the unfortunate absence of a high definition Strictly Ballroom or box-set of the entire Red Curtain trilogy, painters, lovers, designers and cineastes who thrive on creativity as though it were the air up high in Rouge or water in Romeo will definitely want to jump right into these. However, you should go in with the understanding that it's better to take them in spaced at least one day apart and view with enough patience to push back all the layers and excess in order to see the pure love underneath.